As we approach the 50th anniversary of the assassination of JFK, there is some remarkable work being done by journalists and historians around this central but still perplexing event. Here is an article that brings together the journalist Ron Rosenbaum and the documentary filmmaker Errol Morris in a discussion of the famous Zapruder film — the DIY film of the exact moment at which President Kennedy was shot. 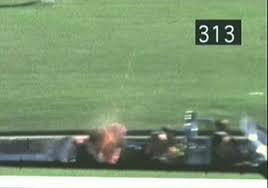 There is a fascinating story behind a single frame of Abraham Zapruder’s home movie. Rosenbaum and Morris also discuss many of the leading works about the assassination, from conspiracy theories to debunking efforts. What is most amazing to me is that even now, there is no definitive explanation of the assassination — not for the physics of the shooting, not for the motives of assassin Lee Harvey Oswald, not for the roles that others may have played. In other words, the central public event of my childhood might or might not have occurred in the way it seemed to, and the grown-ups have yet to tell a convincing story. Read Vincent Bugliosi’s Reclaiming History, http://www.amazon.com/Reclaiming-History-Assassination-President-Kennedy/dp/0393045250/ref=sr_1_1?s=books&ie=UTF8&qid=1383160994&sr=1-1&keywords=bugliosi+reclaiming+history or Richard Posner’s Case Closed to answer your questions.